Add natural-looking, non-reflective, camouflage spray paint to your 4wd to help blend in with nature so you can enjoy all of your favorite outdoor activities. 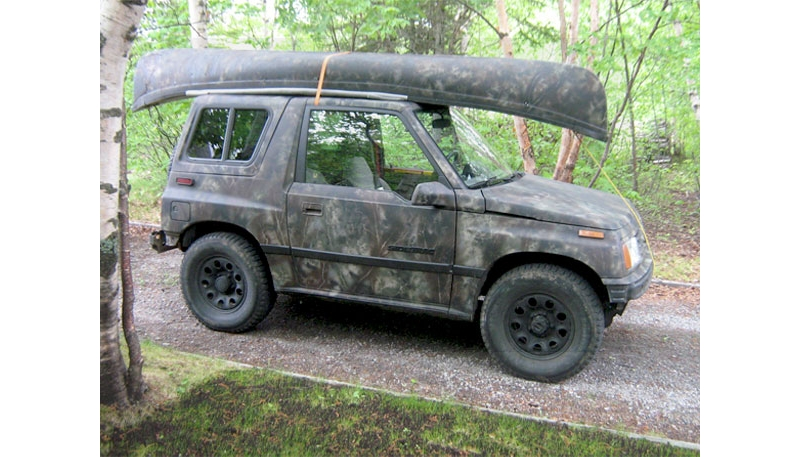 Camouflage 4wd Sidekick was designed by Louis Péloquin. Find other ways to get read for the great outdoors by viewing more Outdoor spray paint projects from Krylon®. The time needed for preparation of the surface to be painted will depend on the actual state of the vehicle’s body. It is important to carefully mask windows and unremovable trimmings; that took me 3 hours. The primer coat itself should take 2 to 3 hours, and the painting took me about 4 hours. If bodywork is needed, this might be a little more challenging than the painting itself. If in doubt, have it done by a professional or a friend with some experience in the matter, making sure the right primer will be used. I think the best advice I could give you is simply doing a test on some object before starting your project. I used my canoe for practice and once I saw the result, it gave me all the confidence I needed to go ahead with my truck. I am certain you will get the same satisfaction of a job well done, and I have no doubt you will be very proud of your completed project.